Early civilisations harnessed waterpower for agricultural processing and raising water for irrigation. Only in the last one hundred years has it been used to generate electricity. Waterpower comes in many forms, from multi-megawatt schemes with large dams and lakes like the Three Gorges Scheme in China, to smaller schemes supplying individual towns, villages or homes. Electricity generation is not the only end product and in many developing countries electricity is simply a by-product of another revenue generating business such as rice milling, water pumping or the direct production of heat for buildings, or horticulture. Waterpower sites are found in mountainous areas where high heads are readily developed with a small diversion weir, a pipeline and turbine such as a Pelton wheel. The higher the fall the greater the power that can be produced. Lowland areas with larger meandering rivers way have numerous old mills. Developed with a weir or combination of weir and canal, these sites may involve a considerable amount of civil engineering. So if a project can utilise existing works that have been constructed for other purposes, the economics can be very favourable. Designing a small hydro project requires that you considered, the site, the system and the application of the energy produced. The selection of suitable equipment comes later in the project when all the factors are known. Frequently the developer or end user selects a turbine without fully considering the implications of a particular device. Political (national and neighbour) and legal considerations will almost always play an important part in determining what you can reasonably construct and the amount of water you can divert. Small-scale waterpower may be used to power remote telemetry and control equipment in the water industry. It may also provide power for or camp lighting, rural hospitals or small-scale village electrification in remote rural areas. This offers an ‘environment friendly’ alternative to diesel driven plants or a contribution to the zero carbon energy supplies in developed economies. Developing countries in particular require simple robust machines that are suitable for local manufacture for driving agricultural machinery, while larger projects over 100 kW for commercial power generation, need to be individually designed to make the best use of the power available. Other applications may include very small units for battery charging, power recovery in industry and low-cost units for agricultural applications and water pumping. The amount of power that can be obtained at a particular stream is determined by the head and the flow of water available. The site is harnessed by constructing a dam or diverting the flow in such a way that all the fall occurs in one place. Where it is not practical to construct a channel, the water may be piped and the head of water is exploited as a high velocity jet driving an ‘Impulse Turbine’. The power available is a function of the fall (head) and flow so building a large waterwheel on a low fall will only increase the cost and reduce the shaft speed but not increase the power. It is misleading to talk about a fast flowing or powerful stream, as the speed of the water depends purely on the gradient of the stream at the point at which you are observing it. Except in very large rivers, the power harnessed simply by ‘putting a device in the river’ is minute. The main power requirements in temperate regions including the UK, is for space heating in the winter months. Low flows in the summer are less important where a national grid system already exists, so there should also be little or no conflict with other water demands when flows are low. The energy required for a household, business or public building is very different from the maximum demand. In the West we have become used to switching on appliances with very little regard to how much ‘power’ they take. Few people actually appreciate the difference between ‘energy’ and ‘power’. The first step is to determine your energy requirement (equates to the amount of petrol you use in your car) and the second step is how you can get the most ‘mileage from it (not by ‘stop/start’ and high peak in ‘power’ demand). The electrical load can be smoothed out by installing a large well-insulated hot water cylinder and/or a heat storage cooker. The objective is to have the turbine running at full output for the water available and to dovetail this with your energy requirement. The system that you adopt will depend upon the actual power output, your budget and personal disposition towards things technical. Electronic Load Governing is a system that we pioneered over 35 years ago and was based on work done by my father in the late nineteen forties to govern the output of waterwheels. In essence the system automatically balances the electrical load on a water turbine or waterwheel so that any surplus energy is automatically diverted into water and space heating. This allows all the output to be used usefully and at the same time it keeps the plant running at the correct voltage and frequency to run your appliances. The distance that you can transmit the power from a hydro scheme to where the power is needed, and depends on the power output, the terrain and the economics. If the plant is less than five kW, the transmission is unlikely to be more than a few hundred yards. Increasing the output to ten or twenty kW makes it worthwhile transmitting the power up to a mile or so, and if you have fifty kW you may consider two or even three miles of transmission line. Except for short distances it will be necessary to transmit the electricity at high voltage and usually underground to avoid problems with lightning. Connecting to the Grid should not be the first choice for very small plants. This is because the protective switchgear is expensive and in the UK the premium for exported units does not make it worthwhile for most small plants. The ‘Feed In Tariffs’ that the UK Government are in the process of implementing, are based on generated rather than exported kWh. There are several systems of connecting and operating hydro plants, either in ‘stand-alone’ mode or in ‘parallel’ with the ‘Grid’ system. Adequate safeguards will have to be made for migratory fish, and if new works are to be constructed, care must be taken with regard to the effect on land drainage upstream of your intake. We recommend that our customers construct all schemes in an unobtrusive and environmentally sensitive manner, and where appropriate we will provide drawings of proven designs. The Human factors, including the owner’s interest in and capability can easily be overlooked, with too much emphasis being placed on the engineering equipment. However good and expensive the turbine, it will only operate satisfactorily if the owner takes care of it. Conversely it is possible for a surprisingly poor quality turbine to be kept running by a capable operator. Although some people may be very keen and technically capable, for others it may simply be an interesting hobby. Upland streams, and may be harnessed by constructing a small weir and de-silting chamber and laying a pipeline of 100 mm to 600 mm in diameter running downhill to the power plant giving an operating head in excess of 20 metres. The pipeline could be as long as 1000 metres provided the gradient is steep enough, and the head is seen as the water pressure where the flow enters the turbine. Pressure piping is expensive, so ion some sites it is cheaper to dig a leat (canal) that follows the contours, and only changes into a pressure pipe for a short steep run down to the powerhouse. In some situations the canal section may be constructed in low-pressure drain pipe or even a wooden flume to reduce the cost and maintenance. For thousands of years waterpower has been harnessed for milling and pumping water but of the 70,000 mills that operated in the UK at the end of the 18th century, only a few hundred are still working. Only mills that have a permanent water supply are generally suitable for redevelopment. Those mills that relied on millponds to store water for a few hours grinding, can seldom provide more than a few hundred watts of continuous power. In some cases the ponds were only needed in the summer months when the water flow was low and this can still be a useful system where the equipment to be driven requires a fixed power input. Although it is not as convenient, as a continuous supply it is efficient, since the plant operates at full power and efficiency when it is running, and this is better than a large plant running at reduced output all of the time. 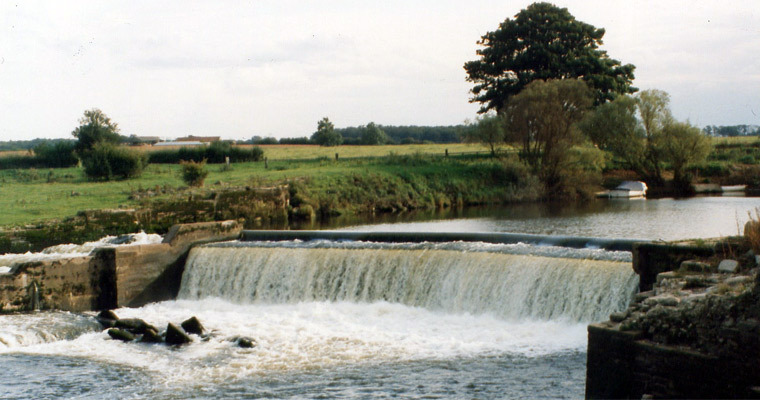 Mills situated on weirs or with short wide diversion channels present the most difficult challenge for the developer if the existing channel or sluices cannot be reused. In many situations it will be more economic to install a plant that is smaller than the site potential, simply to make use of existing structures. The available head could be as low as a metre and the flow required to generate useful amounts of power would therefore be several cubic metres of water per second. The undershot waterwheels that were originally used to harness these sites were large and inefficient so are seldom used today except for aesthetic reasons. The exact layout of the site becomes increasingly important with the lower falls, because access for excavators and to install the large items of equipment is more difficult. Heads ranging from one to three metres may employ single or multiple high-speed propeller turbines with fish screens, ‘Archimedes screws’ or ‘fish-friendly’ turbines. Mills using leats are very common where there is more fall available. The water is brought along the contour from a modest diversion weir to a point where it can drop steeply down to the turbine house using a short length of pressure pipe. Such sites with heads in excess of 10 metres generally use impulse turbines, as they are better able to cope with changing water flows. Water wheels, on the other hand are limited to sites with a head of less than 10 meters and usually less than about 4 metres. They are aesthetically pleasing and have good performance under low water conditions and are fish friendly. Unfortunately, due to their size, they are both costly to build and install, largely because of the gearing required to increase the shaft speed.